"An old-fashioned deli-style bean soup." Rinse beans with water. 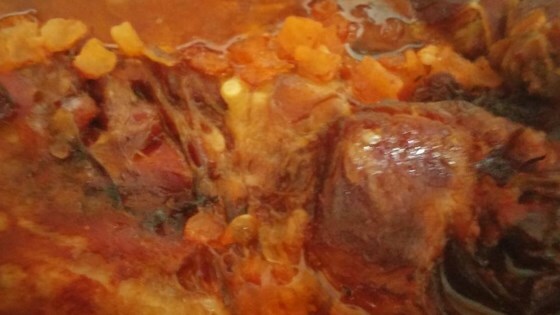 Place beans, onions, tomato sauce, and ham hocks in large pot or Dutch oven. Cover all with water. Cook on low to medium heat several hours until beans are tender. When using crock pot, soak beans overnight. Cook on high for 1 hour. Lower to low for 6-8 more hours until beans are tender. This was a good recipe but nothing like the navy bean soup of my memories. I remember them as creamy and without tomatoes. Nonetheless, it was good once I changed my expectations. Excellent soup. Made alot but freezes well. We love this soup! We do a variation and use Northern beans and sometimes do homemad Italian sausage instead of the ham. Still very good and a very hearty meal!